Hi all! It's Mona here. This past year has been an interesting year to say the least. In my personal life, there have been many ups and downs. In my blogging life - it's been very sporadic. In my sewing life, I have to say, that it's mostly been "ups" - lots of learning, lots of good things happening. My sister, Lisa, and I have been talking about what we want to do with our crafting in the new year. 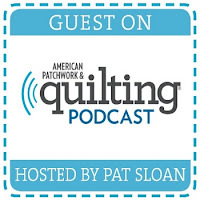 We decided to join quilting JETgirl for her 2018 planning party. What is that? It's an opportunity to reflect on 2017 and set some goals for 2018. In 2017, I went from making key chains, scarves, and a few odds & ends, to making full-blown quilts! I see something that I like and then I want to make it. I've become quite the fabric hoarder and spent WAY too much money on fabric. I steer clear of patterns and usually just try to throw things together. Even though I'm not one to follow a pattern, I did create and had two patterns published on Moda Bake Shop (simple quilt patterns). So what do I want to do in 2018? My sister and I are going to try to post to the blog on a regular basis - showing what we are working on and maybe give some helpful hints. Schedule and hold craft nights throughout the year so that I can get together with friends, do some crafting, and maybe learn something new. Branch out in my sewing - I am not a big fan of cutting fabric to a certain size - I'm afraid I'll mess it up. And, if there are a lot of small pieces to cut up, I get overwhelmed. I want to make myself try a pattern that uses smaller pieces and requires you to follow a pattern. I think I could learn a lot by doing this. Try something other than sewing - or at least incorporate other tools. I think I'm getting ready to bite the bullet and get a Cricut! I'm so excited about how I can use this in my sewing and expand my horizons in other crafting areas. Finally, and by no means the least important goal.... I want to quit comparing myself to others. I follow a ton of quilters on Instagram and I often think, "well - if they can do that, why can't I?" or "how did that person get so many followers" - or similar thoughts. I need to look at how far I've come in the past year and realize that the only thing that's stopping me is ME! Thank you for stopping by. I hope that your 2018 is wonderful and I look forward to sharing my crafty ideas with you! Holding craft nights sounds like a lot of fun! Thank you so much for sharing and linking up. I hope that these goals lead to a lot of creative fun in 2018. Happy New Year!